The award-winning product allows kids to bring any, and all, ideas to life in 3D! This 3D printing pen and its creations are not hot to touch and use compostable, BPA-Free Eco-Plastic, making it completely safe for kids to use. 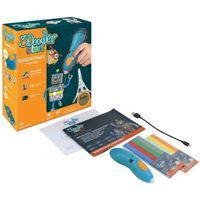 As tactile learning toy, the 3Doodler Start inspires creativity, design, planning, building and spatial understanding - perfect for STEM learning. 3Doodler Start is also the proud winner of Toy of the Year 2017 (Rookie category), and winner of numerous awards including Good Housekeepings 2016 Best Toy Award, The Oppenheim Toy Portfolio Platinum Award, National Parenting Product Award, Scholastic Parent & Child GOLD STAR TOY Award, and Toy Insider STEM 10 to name a few. 3Doodler Start Pen; 2 packs of 3Doodler Start Eco-Plastic; Micro USB Charging Cable; and 3Doodler Start Activity Guide (packed with over 12 step by step projects).